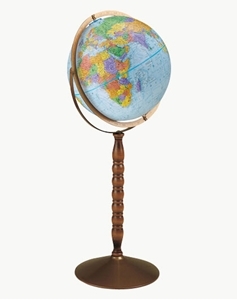 The Austin World Globe is 31" tall, has a 16" blue ocean illuminated globe ball, a solid hardwood stand, a full numbered die-cast meridian, contains more than 4,000 place names & has distinctive political boundary markings. This is a globe to be admired for years to come. 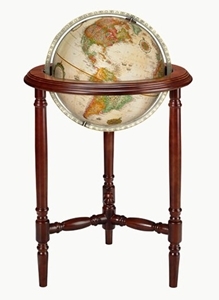 The graceful style of the Cambridge 16" antique ocean globe in a gyro-matic meridian is complemented by the classic design of its rich walnut finished hardwood stand. This world globe ships Free in the continental United States! 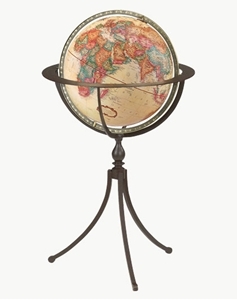 Featuring a 16" diameter, this antique ocean globe combines cartographic excellence with style. 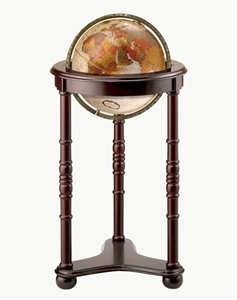 The Commander II World Globe contains more than 4,000 place names and has distinctive political boundary markings. This world globe ships Free in the continental United States! 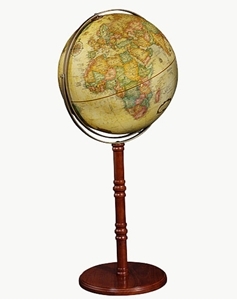 Perched atop an elegant Victorian-style hardwood base, the Conti 12-inch Coronelli globe is a fitting way to highlight both globe and stand. This globe ball was inspired by cartographer Vincenzo Coronelli, who was regarded as one of Italy's finest cartographers. This floor globe also available with the Waldseemüller globe ball. 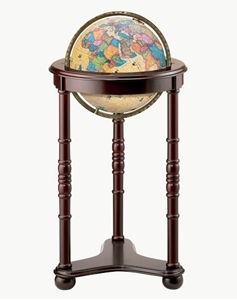 The 12" Lancaster World Globe rests on a dark cherry finish stand, has an illuminated antique ocean ball, a metal die cast meridian, contains more than 4,000 place names & has distinctive political boundary markings. This world globe ships Free in the continental United States! 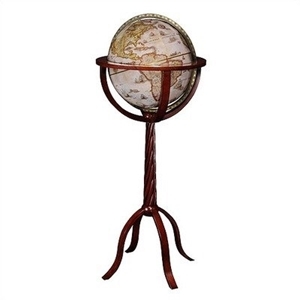 The Lancaster's cherry finish chair side stand with carved accents complements the rich 12" bronze metallic globe ball. The Lancaster Globe also has a full metal die-cast meridian, contains more than 4,000 place names & has distinctive political boundary markings. This world globe ships Free in the continental United States! 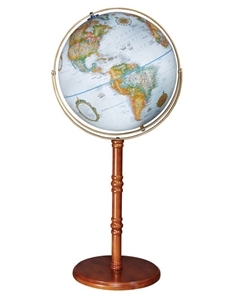 Perched atop an elegant Victorian-style hardwood base, the LaSalle 12-inch Coronelli globe is a fitting way to highlight both globe and stand. This globe ball was inspired by cartographer Vincenzo Coronelli, who was regarded as one of Italy's finest cartographers. This floor globe also available with the Waldseemüller globe ball. 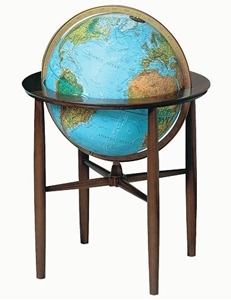 The 16" globe rests handsomely on a hand rubbed, inlaid wood stand inspired by Italian craftsmen, has a hardwood base, an antique ocean globe with a numbered metal die-cast full meridian, contains more than 4,000 place names & has distinctive political boundary markings. This globe ships Free in the continental United States! Handcrafted and worldly, this distinctive stand is fashioned from wrought iron with a rustic textured finish. 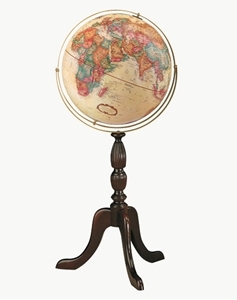 This 16" globe has raised relief features, an antique brass plated meridian, contains more than 4,000 place names and has distinctive political boundary markings. This world globe ships Free in the continental United States! 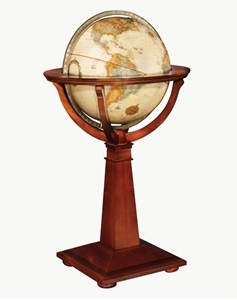 The 16" Stevens Globe is contemporary & classic. 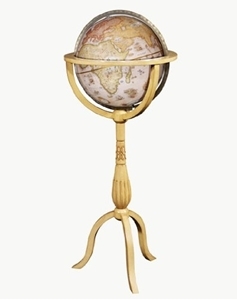 It includes an antique ocean globe ball, a calibrated gyro-matic antique brass plated die-cast full meridian, a hardwood stand, contains more than 4,000 place names & has distinctive political boundary markings. This world globe ships Free in the continental United States!